You can find all answers to various questions about Travertine, Marble, Travertine Pavers, Marble Pavers, Pool Coping and Ledger Stone Veneer. “Natural Stone” refers to a number of products quarried from the earth, used over many thousands of years as building materials and decorative enhancements. These products include Travertine, Marble, Limestone, Granite , Slate, Quartzite, Sandstone, Adoquin, Onyx, and others. They are more than just rocks – natural stone is hand selected from the best, most consistent sources for durability and beauty. Natural stone reflects unique character, stability, and grandeur. Variations in natural stone’s broad range of color, pattern, and texture are visually interesting and impossible to replicate. And, because it comes from the earth, from ecological compositions, it is a natural choice. Travertine is a natural stone from Limestone family, is deposited from mostly calcium and other minerals. Key characteristics of Travertine stone are the holes within the stone which are caused by carbon dioxide evasion. You can use travertine for pool decks, flooring, patios, baths, and showers as well as exterior decor and building materials. What is the French (Versailles) Pattern? The French Pattern is a random pattern set of four different size and covers exactly 8 square feet and consists of 2 pieces 8”x8”, 1 piece 8”x16”, 2 pieces 16”x16”, and 1 piece 16”x24” . The French Pattern set refers to Versailles Pattern or Ashlar Pattern. Travertine Pavers are 100% natural stone, You can find them in various sizes and patterns. They are typically 1.25″ thick and are ideal for pool decks, patios, and driveways. Are Travertine Pavers safe to use around a pool? Travertine pavers are an excellent choice for pools, since they are non-slip and never get hot from the sun. They are a porous material that easily absorbs water making them ideal for use around wet areas such as pools and driveways. They can absorb water to help prevent slips and also flooding. Travertine Pavers are highly durable; they have been in nature for thousands of years and retain their color over time. This is actually one of the reasons why people choose Travertine over other materials, such as brick pavers, which begin to fade and crack within a year or two. They are typically 1.25″ thick and are ideal for pool decks, patios, and driveways. What is the best way of installing travertine pavers or marble pavers? The best process is to clean the area of debris and other hazard. Prepare the base material and the sand bedding, and then lay down the pavers carefully according to your desired pattern or theme. Afterwards, sweep sand over the paver joints to fill them up nicely and then apply sealant. What are the basic steps for installing travertine or marble pavers? We can say that planning on how you will lay out the space, excavating the place if needed, laying base material (Sand Bedding), compacting the ground, edging up around the outside, putting the plastic edging into the ground, laying the pavers, cutting stones, leveling the pavers, filling the joints (filling the gaps), cleaning the surface with the use of a garden hose. 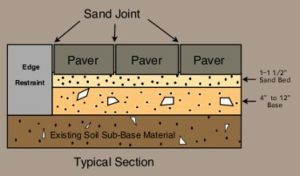 Can I install travertine or marble pavers on my existing concrete deck? Yes, you can install by sand-setting or setting with mortar. How do I prevent weeds from growing between the paver joints? First of all, You make sure that you completely filled up the joints with sand. Next, apply a sealant over the entire paved surface. How can I can clean travertine pavers? Travertine paver stone can be easily damaged by acidic substances, so it is important to use the type of cleaners. Their potential of hydrogen(PH) needs to be neutral. However, before you are trying heavy cleaners start out by using water to wash the stain away. If it doesn’t works use a soap, a brush if necessary to scrub the stain away. What are different types of travertine and marble pool copings? Pool coping is a top layer which covers edges of the pool. There are different types of pool copings. Generally there are two finishes; square edged and bull nose. It depends on the look that you want. Also, if you have children bull nose would be a better option because of its softer finish. What is Ledger stone veneer? Ledger stone panels are the perfect product for adding a bit of excitement and aesthetic to an ordinary wall, column, fire-place, or barbecue. You can install Ledger stone to both interior and exterior applications. Can I install Ledger Stone Veneer around a fireplace? Absolutely, you can install Ledger Stone Veneer around the fireplace. We suggest installation at least 18 inches from any open flame for natural stone and stone veneer. Natural Stone Ledger Veneer products are resistant to extreme heat and therefore we recommend them for use around the fireplace. Is there any special design for Ledger Stone Veneers? The size of Ledger Stone Veneer Panels is 6″x 24″ allowing them to install in a fraction of the time, in comparison to single piece natural stone products used to produce the same look. You can cut the ledger stone veneer panels easily using a standard wet saw, and with the corner pieces available can easily wrap outside 90-degree corners. How can I get cost information? You can contact us directly at 408-660-6043, complete our Online Contact Form.